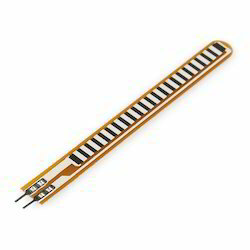 Our product range includes a wide range of flex sensor 2.2, force sensor resistor 0.5, flex sensor 4.5, small force sensor resistor, square force sensor resistor and ttp224-capacitive 4 touch sensor. As the sensor is flexed, the resistance across the sensor increases. The resistance of the flex sensor changes when the metal pads are on the outside of the bend (text on inside of bend ). Connector is 0.1" spaced and bread board friendly. The value of the output depends on the bending of the sensor hence, the output we get is an analog value and this output can be send to ADC IC or of Controller. An Op Amp is used and outputs either high or low depending on the voltage of the inverting input. In this way you can use the flex sensor as a switch without going through a microcontroller. 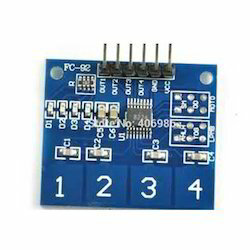 A potentiometer can be added to the circuit to adjust the sensitivity range. sided supply Op Amp. A negative reference voltage will give a positive output. Should be used in situations when you want output at a low degree of bending. Please refrain from flexing or straining this sensor at the base. The usable range of the sensor can be flexed without a problem, but care should be taken to minimize flexing outside of the usable range. For best results, securely mount the base and bottom portion and only allow the actual flex sensor to flex. 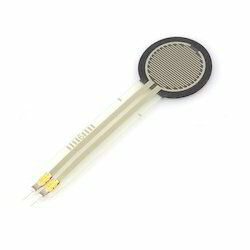 This is a force sensitive resistor with a round, 0.5" diameter, sensing area. This FSR will vary its resistance depending on how much pressure is being applied to the sensing area. The harder the force, the lower the resistance. When no pressure is being applied to the FSR its resistance will be larger than 1MΩ. This FSR can sense applied force anywhere in the range of 100g-10kg. Two pins extend from the bottom of the sensor with 0.1" pitch making it bread board friendly. There is a peel-and-stick rubber backing on the other side of the sensing area to mount the FSR. These sensors are simple to set up and great for sensing pressure, but they aren't incredibly accurate. Use them to sense if it's being squeezed, but you may not want to use it as a scale. A simple flex sensor 4.5" in length. As the sensor is flexed, the resistance across the sensor increases. Patented technology by Spectra Symbol - they claim these sensors were used in the original Nintendo Power Glove. I love the Nintendo Power Glove. It’s so bad! The resistance of the flex sensor changes when the metal pads are on the outside of the bend (text on inside of bend). This is a small force sensitive resistor. It has a 0.16" (4 mm) diameter active sensing area. This FSR from Interlink Electronics will vary its resistance depending on how much pressure is being applied to the sensing area. The harder the force, the lower the resistance. When no pressure is being applied to the FSR, its resistance will be larger than 1MΩ, with full pressure applied the resistance will be 2.5kΩ. Two pins extend from the bottom of the sensor with 0.1" pitch making it bread board friendly. These sensors are simple to set up and great for sensing pressure, but they aren’t incredibly accurate. Use them to sense if it’s being squeezed, but you may not want to use it as a scale. The model 406 FSR is a single-zone Force Sensing Resistor optimized for use in human touch control of electronic devices such as automotive electronics, medical systems, and in industrial and robotics applications. FSRs are two-wire devices. They are robust polymer thick film (PTF) sensors that exhibit a decrease in resistance with increase in force applied to the surface of the sensor. It has a 39.6mm square active area and is available in 4 connection options. Interlink Electronics FSR 400 series is part of the single zone Force Sensing Resistor family. 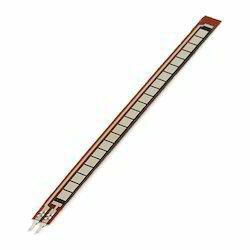 This is a force sensitive resistor with a square, 1.75x1.5", sensing area. This FSR will vary its resistance depending on how much pressure is being applied to the sensing area. The harder the force, the lower the resistance. When no pressure is being applied to the FSR its resistance will be larger than 1MΩ. This FSR can sense applied force anywhere in the range of 100g-10kg. Two pins extend from the bottom of the sensor with 0.1" pitch making it bread board friendly. There is a peel-and-stick rubber backing on the other side of the sensing area to mount the FSR. These sensors are simple to set up and great for sensing pressure, but they aren't incredibly accurate. Use them to sense if it's being squeezed, but you may not want to use it as a scale. This article is about the sensing technology used in human interfaces. 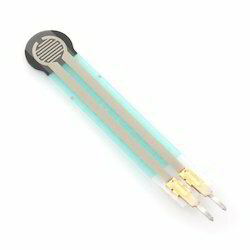 For the device used in distance measurements, see Capacitive displacement sensor. In electrical engineering, capacitive sensing (sometimes capacitance sensing) is a technology, based on capacitive coupling, that can detect and measure anything that is conductive or has a dielectric different from air. Many types of sensors use capacitive sensing, including sensors to detect and measure proximity, position or displacement, humidity, fluid level, and acceleration. Human interface devices based on capacitive sensing, such as trackpads, can replace the computer mouse. Digital audio players, mobile phones, and tablet computers use capacitive sensing touchscreens as input devices. Capacitive sensors can also replace mechanical buttons. 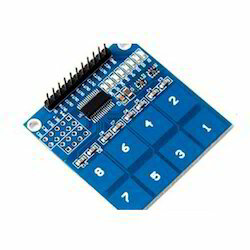 This capacitive touch sensor module uses the TTP226 integrated circuit, making it easy to add capacitive touch input to your project. It features 8 sensitive touch pads that make an ideal replacement for the old fashioned switches. 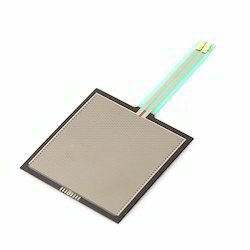 Looking for Force Touch Sensor ?